This truck is owned by Terry and is a work in progress. 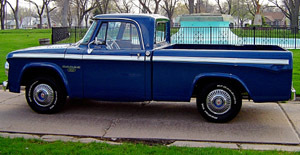 The truck was sold new in St. Paul, Nebraska. I am the third owner of the vehicle. 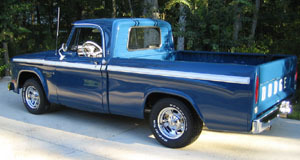 The second owner bought the truck in 1969. The original owner is dead. The dealership that originally sold the truck is now just a repair shop. I talked to the guy who runs it now and he thought they would have a copy of the window sticker on file, but I haven’t been able to motivate him to find it yet. I’m hoping when the truck is done if I take it up and show him he might start looking for it. As you can see the truck has a 383 and 51K original miles. The body was in relatively good shape. I had to replace 2 small sections in the floor board and both rocker panels. The truck was taken down to the bare frame and I have been rebuilding it one section at a time. It is now ready for paint and hopefully the body shop will have an opening in the middle of January. There is one peculiar feature of the truck. It has 14” rims on it and no hub caps. I talked to the second owner and he said that was the way it was when he got it. I don’t know if it originally came that way or they were swapped out. I don’t know why somebody would do this though. I will send some pictures of the progress and I’ll send more when it gets back from the paint shop. I added the four barrel intake system. I really plan on driving the truck when I'm done, so I wanted a little extra power to play with some of the new vehicles. I also added '69 high performance exhaust manifolds and 3" stainless exhaust. I kept the original intake and exhaust for the future and I have an NOS exhaust system for it. The seats are original and I sent a picture to Year One and they said they are '67 Dart GT seats, which would make sense. The instrument cluster is non-heavy duty (no tach), but mechanical oil pressure. It does have the 4 1" stripes. They are vinyl tape as near as I can tell (black). I was unable to find the build sheet. I looked everywhere but no luck. I am currently working on the steering wheel (white) before I take it to the paint shop. Do you have any idea how many of these were made? (editor's note - no idea but not many - i know of two other 67s but no visual proof of them) Like you said it is the only '67 I have seen also. What about the value? I wondering for insurance purposes. I'll probably have around $10K in it when I'm done. I don't know if to insure it for around that figure or go higher. Have a good new year. 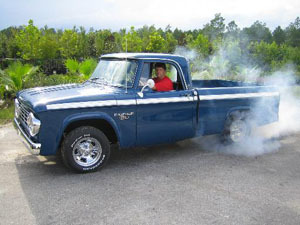 Terry recently sold this truck to David Stallings of Florida. see new pics below - congrats David, you have a fine ride and Terry sure found his truck a good home with you! The truck originally came with a 383 2-barrel. The drive train is still original. 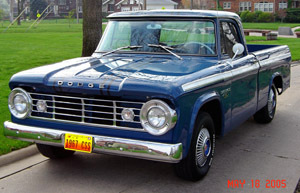 The truck was sold new in St. Paul, NE and as near as I can tell I am the third owner. The person I bought it from purchased in 1969. I will list the things done to it, some of the changes, and some issues that would need to be taken care of to put it back to show room original condition. 1) The engine needed to be bored .030" to take the taper out of the cylinders. It has 9.1 to 1 compression pistons in it. 2) The crank had to be turned down .010" on both the mains and rod journals to clean them up. seats were installed with the new valves. 4) It currently has a Mopar Performance dual plane 4 barrel intake and new Carter 4 barrel on it. The transmission kick down had to be changed to a cable type to work with the new carburetor. I have the original intake, carb, and kick down linkage. The 2 barrel carburetor would probably need to be rebuilt. 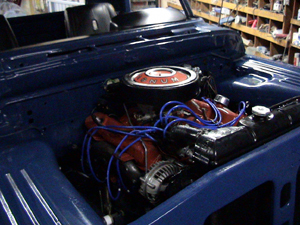 5) The ignition system was upgraded to a Mopar Performance electronic unit with Orange Box. I still have the original distributor. 6) The exhaust manifolds were changed out to 1969 High Performance with 3" drops, these were powder coated. The exhaust is 3" stainless steel dual, welded from front to back. I have a good original head pipe and NOS pipe from the head pipe to muffler, and the original exhaust manifolds. 7) The cam is a Mopar Performance Big Block original magnum grind. It is the one they sell for restorations. 1) The transmission was rebuilt with a new valve body, clutches, seals, and bearings. 1) The box, cab, and fenders were removed from the frame at the beginning of the restoration. 2) The frame was cleaned up and painted with POR 19 primer and Rustoleum Hammer Black paint. 3) The differential is the original posi-trac unit with 3.54 to 1 gears. The clutches and bearings were replaced. The rear end housing was powder coated black. 4) Both front and back springs were rebuilt with new bushings and pads between the leafs. 5) The rest of the miscellaneous suspension parts shackles, hangers, etc. were powder coated either cast gray or stamped metal gray. I went by different automobile concour's restoration photos to determine what colors they needed to be. 6) The brakes were built with new shoes, drums, springs and wheel cylinders. 1) The gear box was rebuilt with new bearings and seals. I think I got the bearings adjusted a little tight because it is pretty stiff. 3) All parts powder coated correct color. repair units, not remanufactured ones. 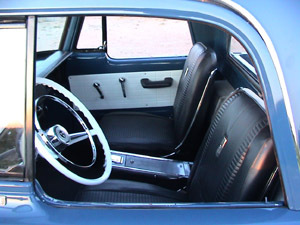 2) Portions of the cab floor were replaced with replacement units from Vintage Power Wagons. 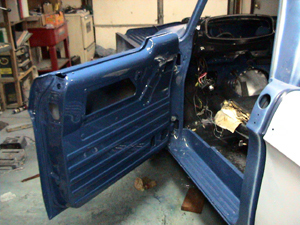 3) The interior of the cab was painted and the floor top and bottom were undercoated. 4) The inner fender well removable panels were powder coated. 5) The rubber weather seal panels at the radiator support and fenders were replaced with NOS parts. 6) The windshield is new, not NOS. 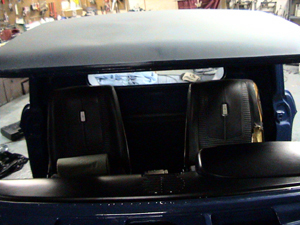 7) All of the gaskets for the windshield and rear window are new, not NOS. 8) The gas filler cap is an NOS locking style and the rubber hose connecting the tank with the filler neck is NOS. 1) The box floor is a little wavy. It doesn't have any holes though. It was Rhino Lined a matching blue color. The floor would have to be replaced to make it a museum piece. 2) The tail gate was perfect except for the pivots which were replaced with NOS units. 3) The tail light lenses are NOS. 4) The reverse lights (housing) and lenses are NOS. 1) The trim is either NOS or very good originals. It was all polished and the white portion was stripped and powder coated. 2) There is one small connector piece missing on the drip molding on the cab. I haven't been able to find a suitable replacement piece yet. 3) The emblems and hood letters are all NOS. 4) The bumpers were re-chromed. 5) The grill is very nice, not NOS but still nice. 6) The head light pie plates are not NOS, but they were polished and are very nice. 1) The alternator was rebuilt. 2) The under hood electrical harness is NOS. 3) The voltage regulator and horn relay are NOS. 4) The majority of the switches in the Cab are NOS. 5) The battery is a MOPAR reproduction vintage group 24 battery with red caps. 6) The batter cables are NOS. 1) It did come with 14" wheels and tires from the factory. 2) As you can see the tires are B.F.G.'s. I really debated on putting original style bias ply tires on, but I wanted to drive it so I went with the radials. 3) The hub cabs are NOS. I did remove the plastic center piece out of them, stripped the red paint and painted this portion blue to match the truck. I thought the red kind of clashed with the blue body. 1) The carpet on the floor of the cab and over the gas tank is new. I added extra sound deadener insulation panels in the floor. 2) The seats covers have new foam and covers from Year One. I matched the originals to 1967 Dart GT seats. 3) The head liner is white perforated white vinyl. Which is not correct but I couldn't find any of the original material. It looks nice though. 4) The weather stripping on the doors is new. I can't remember where I got it at, it's not NOS, but it is correct for the year. 5) The vent glass rubber seals are NOS. 6) The felt liners in the doors for the windows are all NOS. 7) All of the gauges except the speedometer are NOS. 8) There is something wrong with the speedometer; it shows almost exactly 1/2 of actual speed. I haven't figured it out yet. 9) The radio works, and the knobs and dial are NOS. The speaker has been replaced with an aftermarket piece. 10) The heater and defroster work fine. The heater coil or radiator was replaced. The water control valve is NOS and the control cables and knobs for the defrost control and vents are NOS. 11) Dome light is NOS. I'm sure I have missed some things, but this kind of gives you a little idea on the effort I put in restoring this truck. The project lasted over 8 years so I had a lot of time to assemble NOS parts. I can't think of one thing on this truck that has not either been rebuilt, re-plated, re-painted, powder coated, or replaced with NOS. 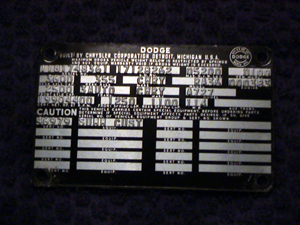 I have restored several Chrysler products and I build them to drive and enjoy, even if it means varying from original. The truck drives straight and is a blast. It recently won best truck at an all MOPAR car show here in Nebraska.